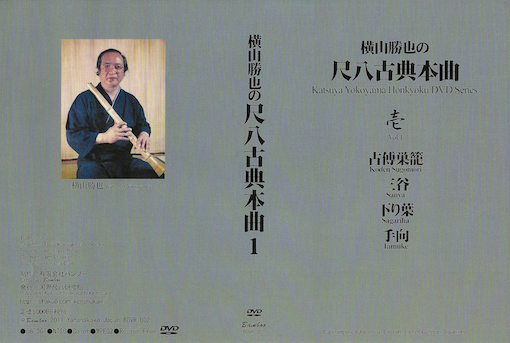 Some decades ago, Yokoyama Katsuya sensei (founder of the Kokusai Shakuhachi Kenshukan, disciple of Yokoyama Rampo, Fukuda Rando and Watazumi Do and shakuhachi muse of Takemitsu Toru among many other things) filmed a series of videos that were later published in VHS. In those videos, using a 1.8 shakuhachi, he was not only playing the main honkyoku pieces, but also teaching them; talking (in Japanese of course) about key elements of the pieces from his unique point of view. Many years later the Kokusai Shakuhachi Kenshukan re-release them in 4 DVD´s and even later (a few years ago) started to release them one by one (the first was published in 2011 and the second one has been released recently) this time with subtitles in some of the main western languages. Reaching to professional shakuhachi players related to Yokoyama teaching, the KSK new releases include English subtitles by David Wheeler, French ones by Veronique Piron, German ones by Jim Franklin and Spanish ones by Horacio Curti. These materials will not be able to replace a teacher, there are no big hidden secrets revealed here. But they represent a very interesting and good way to get in contact with KSK honkyoku from the hand, the word and the example of his founder: Yokoyama Katsuya sensei.